One of the most sought after collectibles in Christian music is this three guy two-girl Georgia group’s private press featuring a young high school Mark Heard. 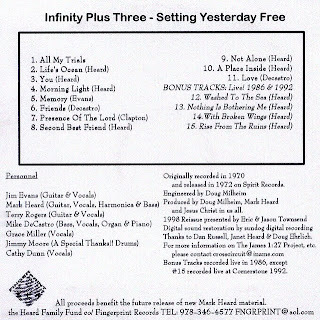 Although Setting Yesterday Free has little in common with Mark’s respected solo recordings of the ‘80s and ‘90s, the album does have an artful refreshing acoustic folk-rock style, home-made as it may be. You can hear Mark on several tracks, but the other vocalists, songwriters and musicians do a fine job as well, so it’s definitely a collective effort. Five of the songs were written by Mark, some like ‘You’, ‘Not Alone’ and ‘A Place Inside’ suggesting the James Taylor-ish acoustic style he would introduce on On Turning T0 Dust. On ‘Second Best Friend’ he sings of one who “opened up the door to my best friend” (later identified as Jesus). Glowing organ presence interacts with the acoustic guitars on ‘Memory’ and the rustling ‘Life’s Ocean’, while piano takes the spotlight for ‘Friends’ and ‘Love’. The only non-original songs are “All My Trials’ and Eric Clapton’s ‘Presence Of The Lord’, Heard contributing harmonica to the latter. Nice layers of acoustic guitar work throughout. Re-issued on CD. 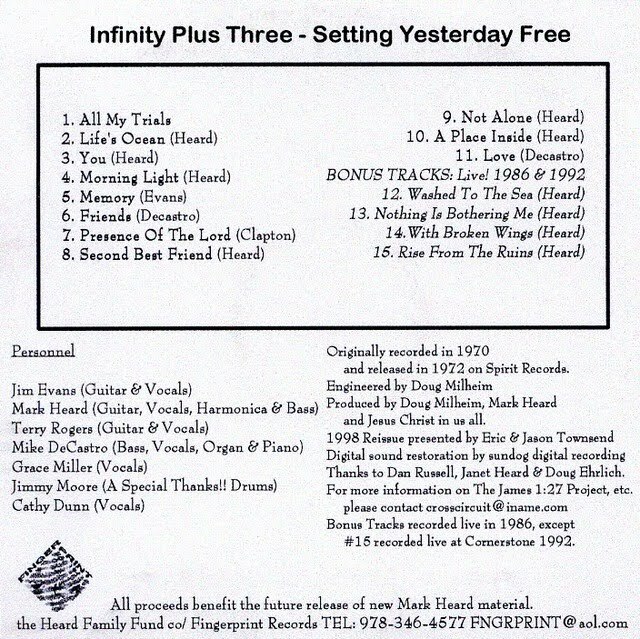 Any other way to get the Infiniity +3 mark heard album..maybe mediafire…thanks…..